Steven: Sometimes I get worried about how easily Loey is able to bewitch entire groups of people. "Ohhhhh," they sigh, as if experiencing one of Life's Mysteries, "she's so beautiful..." And talk about melting your heart, when she holds out her arms and looks openly and expectantly right into your eyes, how can you not fall in love with her, and want to pick her up, and be willing to do anything for her to be happy? Veva: Yeah, but what really worries me is that she does it to get their boots. This is true. Loey really loves boots, the higher the better, the more leather, it seems, the better. 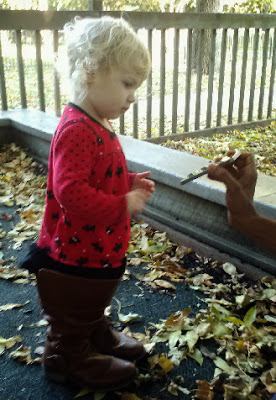 We were at a popular park on Saturday and Loey noticed a mom with (we found out later) a 19 month old boy - and really nice, high, leather boots. She walked right over, stood in front of the woman, looked up at her, looked down at her boots. I explained: "Sorry, Loey really likes boots, she wanted to come see yours." The woman was instantly enchanted and delighted and offered to let Loey wear one. Oh, she had no idea. Loey immediately kicked off her shoe. Actually, it was Indigo's shoe. Indigo is Loey's best friends, 9 months older. Anyway, Loey dissolved into tears when Gogo - as she calls Indigo - tried to wear her own shoes to the park. She wanted to wear Gogo's shoes. So eventually Gogo saw the light and offered them to Loey to wear. Loey has a "thing" about footwear. Well, I helped her into this big beautifully sewn boot with a zipper up the side. The top came up to her waist. And then she made abundantly clear that she wanted to wear both of them. And so in another moment or two, that was also arranged. About eight people total were watching this, all of them smiling or laughing, as Loey proceeded to walk around and call out "Gamma, yook" and "Mama, yook". Finally, though, it was time for them to go. Loey gave up the boots, I put her (Gogo's) shoes back on, and then she held out her arms to the mom. They hugged and then Loey climbed up on her lap. Happiness descended on all of us like the scent of beautiful flowers on a windless day. That's the sort of effect Loey has on people. And that's why her grandparents are worried. Will she use her great powers only for good?